Like Jon Snow joins hands with Daenerys Targaryen, Stalin has allied with the Congress chief Rahul Gandhi. Surprisingly, the DMK version takes a jibe at Rahul Gandhi’s parivar too. Chennai: Here’s the latest release from the Dravidian election theatre — the DMK’s Game of Thrones. The media-savvy DMK has come up with its Tamil version of the popular American fantasy drama, Game of Thrones, just days before Tamil Nadu goes to polls on April 18. In this nearly three-minute DMK video circulated on the WhatsApp, the marauding White Walkers from the North is obviously the “casteist, fascist saffron clad brigade” led by Narendra Modi. Pitted against White Walker Modi is Jon Snow, the younger son of warrior Ned Stark. No marks for guessing who Jon Snow of Tamil Nadu us. He is none other than Thalapathi (commander) Stalin, who has valiantly marched to save the ‘Seven Kingdom’, which is Tamil Nadu. Like Jon Snow joins hands with Daenerys Targaryen, Stalin has allied with the Congress chief Rahul Gandh. Surprisingly, the DMK version takes a jibe at Rahul Gandhi’s parivar too. “Rahul is almost like Daenerys whose people had once misruled the nation. 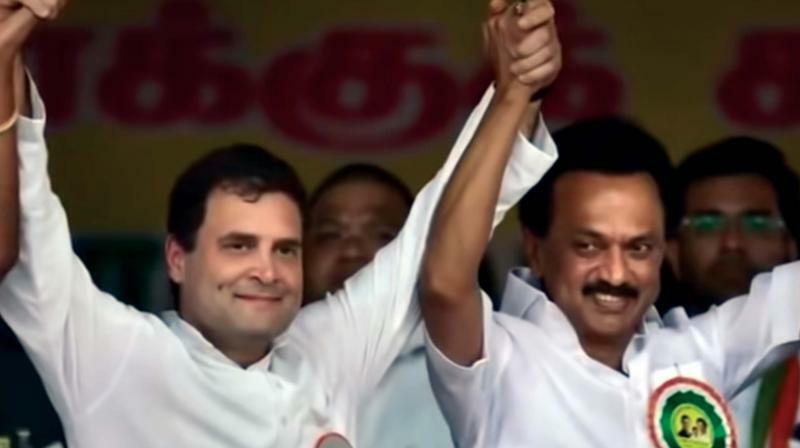 But our Tamil Jon Snow, Stalin allies with Rahul because he possesses the potent dragon, which can destroy the White Walkers, says the impressive DMK video. Interestingly Stalin’s sister, Kanimozhi is likened to Sansa Stark who steadfastly stands by Jon Snow. You would be surprised to know who the persecuted Arya Stark is-the 2-G fame A Raja, who was jailed in the Spectrum scam and ‘declared innocent’ by the court subsequently. The DMK video, predictably, has a role for Chief Minister Edappadi K Palaniswami as well. He is Cersei Lannister who has ganged up with the White Walkers. “Edappadi has gone one step worse than Cersei. She did not join the White Walkers, but Edappadi has - he has joined hands with Modi. The DMK’s Game of Thrones is not without its share of smirk-evoking surprises. The video claims Robert Baratheon and Ned Stark, who fight against the White Walkers, were “close friends like MGR and Karunanidhi” though it’s well-known that the two were bitter political foes in Tamil Nadu. The video describes Jayalalithaa as an iron lady.